Hawk was a wild man as a youngster. While he actually had more handling as a yearling and two year old then the other colts his age, because he was so challenging, he still was the hardest to deal with. Things like walking through gates, leading, being brushed, having his feet trimmed … he just couldn’t quite “get it”. He would lead walking sideways with his mouth open, like he might bite me at any moment. Naturally, I adored him, and chose him for my next show horse. I always did like a challenge! When he was a two year old I decided I’d take him to a show, and in the hopes the outing would be a good experience for him and help him be a bit braver. 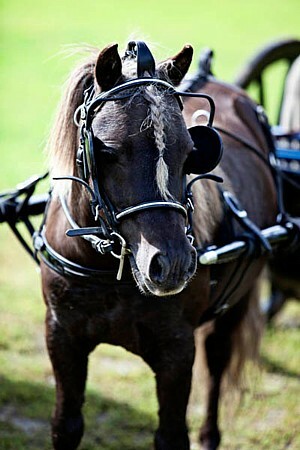 But there was a catch – I COULD NOT get him to trot with me on a halter. And my attempts just freaked him out, I’d start running and he’d take off and jerk the lead out of my hands, or he’d stop dead and not move at all. So then I tried using the end of the lead to tap his bum and encourage him to go forward, and he would run right into me and knock me down, getting away again. I decided I couldn’t be the source of encouragement to get him to move faster, so I had someone else try to give him a bit of a chase, and he did the same thing, crashing into me, knocking me over and getting away. Which wasn’t ideal in many ways, not the least of which being that he was hard to catch! It was the first time I was really forced to think outside the box. Clearly what I was doing wasn’t working at all with this horse. I decided – I don’t remember why – that I would teach him to jump. We started at a walk, because that’s what we were able to do, and he clearly had an aptitude as he popped right over. 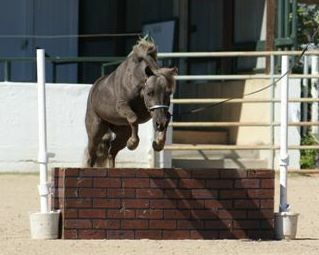 And then when I asked him to trot towards the jump, there was no more freaking out. Now, trotting had a point! It got him to the jump, which was fun! 14 years later, I’ve learned how much more effective it is to have a horse go towards something they like, instead of away from something they don’t, but my first foray into “target training” was a complete accident, because I was forced to be creative by a horse who didn’t understand the way I usually did things. That was far from the last challenge with Hawk, but we did manage to get through the first show and embark on driving training through that summer and fall. 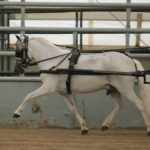 He actually found the basics of driving less overwhelming that he did everyday things like being groomed, but we discovered another challenge the following year as he was nearing his first show. I tried everything that I could think of, most of which I’m ashamed of now that I’ve learned so much more. I tried overchecks and martigales, draw reins, different bits and I cried a lot of tears. I felt like I was ruining a horse that I really thought was something special. I’d drive Hawk, and then go out to the pasture to cry into Image’s mane, realizing that most of what Image had won was due to his innate talent, rather than anything I taught him. I figured that I’d probably be able to work through Hawk’s issues if I just kept driving him, but that I couldn’t be the first person to have these issues and there was probably a better way. I’d always been a fan of dressage, and I knew that balance was a big part of Hawk’s trouble. 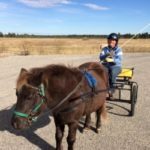 I knew driven dressage was a thing, so I started researching and found a carriage driving instructor nearby and booked a lesson. 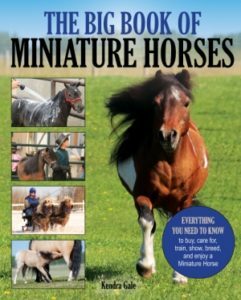 At that point, I’d been driving Miniature Horses for close to 20 years, but one challenging horse taught me how much I had to learn. I started learning everything I could about biomechanics and the training scale and building strength and balance in a driving horse. I took off his check, and learned that part of his trouble was that he found even a loose sidecheck very uncomfortable. We drove a million circles and patterns. We both learned to find a rhythm, with the help of our rhythm beads. I learned to recognize bend, and relaxation, and when he was using his hind end, and most importantly I learned that it really didn’t matter where his head was, and it would come in time. We started to see some progress, but he was still crooked. I’d gotten Dr. Hilary Clayton’s book, Activating Your Horse’s Core, and was working with Hawk on the stretches. But on one side, he’d reach towards the treat only once and give up, staring straight ahead and refusing to even take a treat at all. I had a vet and chiropractor look at him, and they found nothing that should be bothering him. As so often seems to happen, I came across the info I needed just when I needed it – it’s so important to take every opportunity to learn! I was at a conference and heard a lecture on myofascial release. The instructor gave us a simple myofascial treatment we could do on our own horse and I tried it as soon as I got home. Part of it was gently stretching the skin on his ribs and holding it for 20 seconds. When it did it on his stiff side I could feel when the fascia released, and he gave a big sigh. 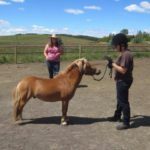 It was a huge turning point for him – suddenly he could do his stretches that direction, and with continued work, he became a straight, strong and balanced driving horse. Even when he was driving well, he never seemed super engaged in what we were doing. He was hard to catch, and did what I asked but without a lot of excitement. I don’t remember what made me decide to start teaching him tricks, but it was a game changer. I swore that tricks made him smarter, than he “learned how to learn” and went from just going through the motions of what I was asking him to do to an engaged and keen partner, not just while doing tricks but in everything I did with him. It seemed unbelievable to me at the time, but that was my first, unintentional foray into training with positive reinforcement. All the things I said were happening, not really believing it, were actually happening. He learned how to learn, and realized it was fun, because I used positive reinforcement – and not very well done positive reinforcement, since I really didn’t know what I was doing. Even still the results were amazing, and suddenly I had the partner I’d always wanted him to be. 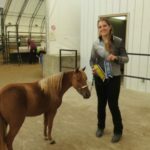 My challenging horse taught me the value of positive reinforcement. I remember the first lesson I took the instructor asked me if I had any interest in doing combined driving and I said a pretty emphatic no, I was only there to improve my driving for the show ring. 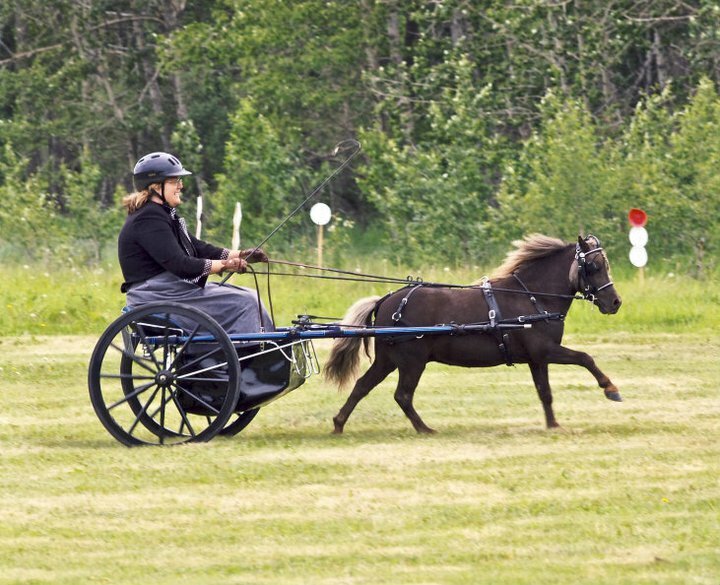 But when you’ve spent so much time working on your dressage skills you kinda want to drive a dressage test. It took me years of research and practice before I jumped in to try it, but Hawk and I LOVED combined driving, so I have him to thank for something I still enjoy today as well. Hawk is 16 years old this year. 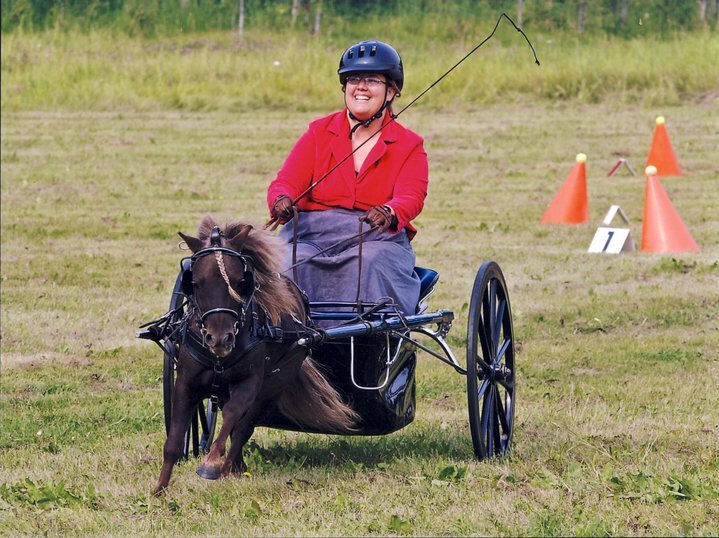 An injury and subsequent arthritis ended his performance career, but he is happy to show off his tricks or do some painting any chance he gets, and has been a first introduction to Miniature Horses for so many people. One “difficult” horse taught me so much that I use every single day to help my own horses and my student’s horses. Hawk was a gift, wrapped up in a fearful, confrontational, tense package. If you have a challenging horse, even if you’re still in the crying tears of frustration stage, be sure to thank them – they’re making you a better horse person. 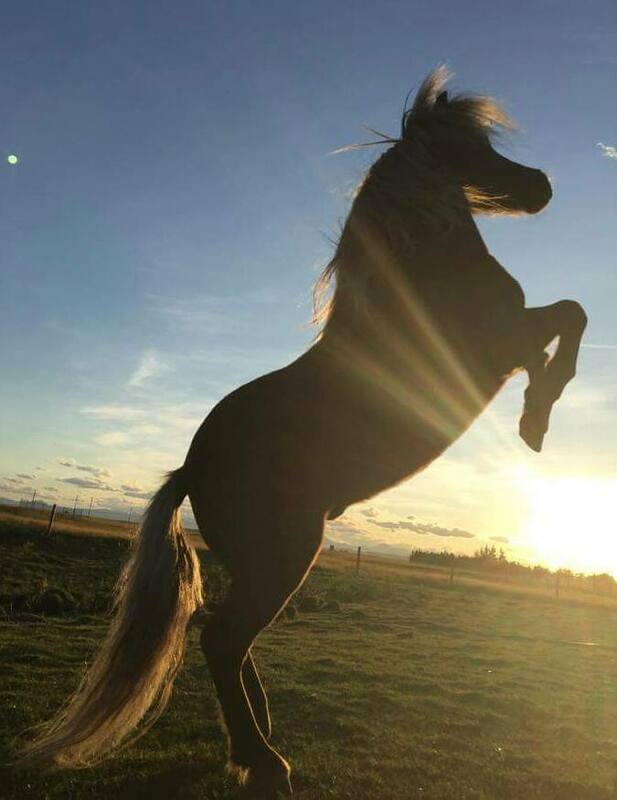 Have you had a challenging horse that’s helped you grow as a horse person? I’d love to hear your story!